Co-working sometimes gets an unfair reputation for sacrificing privacy and quiet. In fact, the opposite is often true. Sharing office space can be a fantastically secure and productive way of working and we want to dispel any myths that say otherwise. In this article, we run through the reasons why it is certainly not the case that co-working sacrifices privacy. We also look at specific efforts made by co-working business centres like Us & Co make to make sure that their members have a quiet, productive, personal space to work in. From the spacing of desks to the selection of furniture, a lot of thought and planning goes into the layout of a co-working space. Panels on the side of desks ensure that every individual worker can work on confidential projects without being overlooked. Break-out spaces are also typically kept very separate to working stations, with dedicated areas or rooms for breaks and lunches. This means that the coffee-break chatter doesn’t distract fellow co-workers who are sat at their desks. Despite a misguided perception to the contrary, co-working spaces don’t allow just anybody to ‘come-and-go’ as they please. Shared offices often adopt fob-card entry systems, door codes or networked entry key cards. This means that only paying members can gain entrance to the space. Similarly important is the efforts put in place to protect co-workers’ personal belongings. From dedicated bike storage space to personal lockable cabinets, co-working doesn’t have to mean the hassle of taking everything with you every time you leave the office. Privacy and security are no longer essential in just a physical sense, but are also crucial from a digital perspective. Compared to consumer and retail online fraud, which have been declining in recent years, cybercrime against businesses in the UK has grown by a worrying 63% since early 2017. 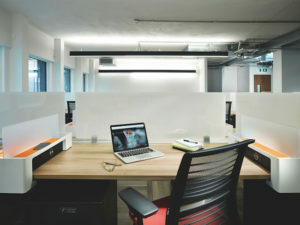 It is therefore a growing priority for co-working spaces and shared offices to provide their members with secure, fast internet connection. For example, all At Us & Co members have access to our super fast and highly secure WiFi, the cost of which is fully included in the up-front membership fees. We have a 1gb resilient internet line that allows for an average upload/download speed of 70mbs per second, meaning that members can surf with confidence. Privacy in co-working spaces doesn’t end with the work you do while sat at your desk. Many co-working brands offer private bookable meeting rooms, specially designed to keep your discussions among your team only. Sound-proofing panels are often installed on the walls of meeting rooms to stop your conversation spilling out. 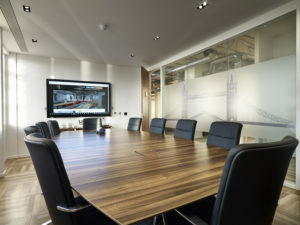 Similarly, frosted glass doors and windows are a great addition to a private meeting room, preventing anyone from seeing in whilst still allowing for the essential flow of natural light. Ultimately, co-working spaces attract like-minded members. This is largely due to the nature of co-working, and how its convenience and flexibility appeals to up-and-coming businesses, SMEs and start-ups. The vast majority of co-workers are dedicated to getting on with their own work, respecting those around them and focusing on the task at hand. Here at Us & Co, we specialise in providing our members with a professional setting in which they can concentrate and thrive. With every new member through our door – from co-working to private office members – we emphasise the importance of considerate working and respect for fellow workers’ space. As a result, we are proud of the mindful environment we maintain. 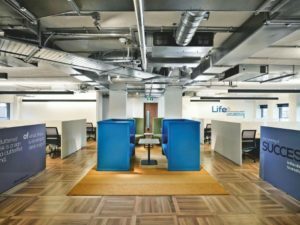 See for yourself how conducive co-working set-ups are to privacy and productivity, by booking a tour at one of our business centres in London Monument or Dublin St. Stephen’s Green.